The bank wanted to understand what data it had across various systems, its value to the business, and the ability to detect PII (personally identifiable information). Our software, AI.DATALIFT, analysed all of the bank’s data within a few days, running at a rate of 5 million items per hour. AI.DATALIFT allowed the bank to uncover the data it no longer needed, classify the remaining data, and manage GDPR compliance. 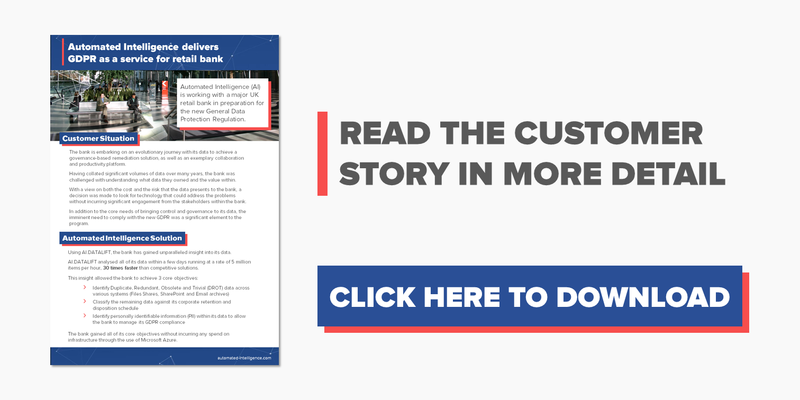 For more information on how we helped this retail bank prepare for GDPR, please download our full case study below.